Moving can be a pain for everyone, but that pain may hit particularly deep for your anxious child. Anxiety levels can skyrocket, filling your child with fear and dread. Your child may become quiet and sullen or act out in anger, both of which may be signs of depression, according to Psychology Today. Your child may start to do poorly in school or have trouble sleeping. That doesn’t mean, however, your move is going to be a disaster. Being aware of the potential risks and additional anxiety that may plague your child puts you in a better position to deal with it in a positive manner. How you deal with the move in the present moment can also have long-lasting effects on your child’s mental health in the future. A study published in the Journal of Personality and Social Psychology showed the effects of childhood moves don’t necessary disappear once those children become adults. Researchers discovered this by following the moving patterns and well-being of more than 7,100 American adults over a 10-year period. The overall verdict? Those who moved the most as children tended to have the lowest levels of well-being as adults. But there’s a catch. This correlation only seemed to apply to introverts and not extroverts, with extroverts keeping their outgoing, positive nature that allowed them to reach out and forge new relationships wherever they may roam. Those who moved frequently as children often ended up with fewer “quality” or deeper relationships as adults. The more moves people experienced as children, the less “life satisfaction” they felt as adults. Those who moved very frequently as children tended to have a shorter lifespan, with some of the very frequent movers already dead by the time researchers attempted to contact them for a follow-up. “These findings indicate that residential moves can be a risk factor for introverts and that extraversion can be an interpersonal resource for social relationships and well-being in mobile societies,” the study says. This does not mean you have to stay put in once place just to keep your child’s anxiety levels low. Not all moves are bad moves. In fact, some moves may induce little or no excessive anxiety whatsoever. Children in military families who move frequently may fare better than children who move for other reasons, according to University of South Carolina psychology professor emeritus Frederic Medway. Medway studies family relocation and he says the military’s ability to help families transition into new surroundings plays a role, as does the fact that other children associated with military families are going through the exact same thing. Children who move due to foreclosure, divorce or even a parent’s new job may not fare as well. The first two circumstances are often linked to a loss of income and loss of the family unit, respectively. One spouse’s new job relocation may not always sit well with the other spouse, thereby injecting overall stress and anxiety into the entire family. Young children and older children tend to take moves more in stride than the middle school crowd, Medway says. Puberty probably has a lot to do with it, with children already experiencing a whole slate of changes that can become even more confusing or scary when you pile a relocation on top. Where you’re moving from and to also play a part on how well your anxious child may take it. A study published in the American Journal of Public Health showed that an upwardly mobile move that involved relocating to a higher-income neighborhood was not a bad move at all. The study looked at a number of families that moved out of New York City high-poverty public housing neighborhoods into private homes where poverty levels were not as drastic. Researchers then did a follow up three years later, comparing the well-being of those who took the upwardly mobile move to those who remained in public housing. Families who took the upward step were much better off mentally than those who stayed in public housing. The research showed parents who moved “reported significantly less distress” while boys who moved “reported significantly fewer anxious/depressive and dependency problems” than their public housing counterparts. “This study provides experimental evidence of neighborhood income effects on mental health,” the study concluded. Regardless of when, where or why you’re moving, there are several steps parents can take to make the transition easier for their anxious children. Don’t keep it a secret. Parenting magazine suggests telling your anxious child about the move as soon as possible. Your child is likely to feel more anxious if he feels something is going on and doesn’t know what it is than at least knowing what’s coming. Focus on the positives. The biggest positive point may be that the family is moving as a unit and the pets, possessions and favorite toys all get to come along. You can also highlight exciting new things in store in the new location, such as a nearby park or awesome playground. Let children say their goodbyes. Saying goodbye to neighbors and friends is an obvious one, but your children may also want to say goodbye to their favorite playground, lakeside picnic table or front yard tree. Help your child create a soothing ritual where you remind him or her that these people and things will still be here and you may be able to visit down the road. 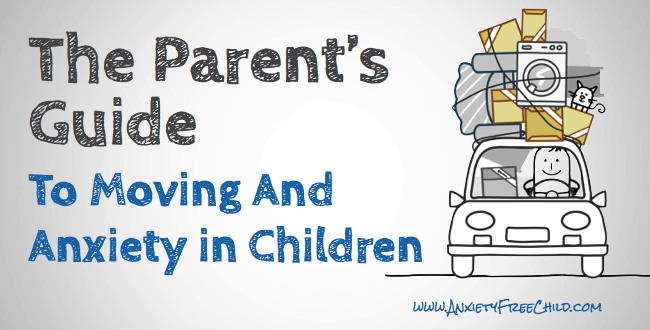 Consider letting your child avoid the moving truck scene. Anxious children especially may become very upset seeing the movers hauling everything into the back of a truck. They may do better on an outing with friends or neighbors during the loading and returning when you’re ready to roll. Emphasize things that will stay the same. Anxious children often feel most secure when they have a regular routine and things they view as permanent parts of their lives. The former can include sticking with the same bedtime and playtime schedules while the latter definitely includes a loving family that supports your child every step of the way. Listen. No matter how your child reacts to the move, letting him or her know you’re there to listen can make all the difference. Remind your child that no emotions are “right” or “wrong” and talking about them can help immensely. Then sit down and be ready to listen.